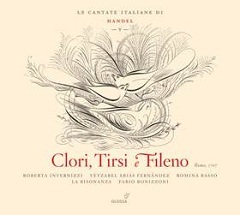 We are delighted to award first prize to Fabio Bonizzoni, La Risonanza and Glossa for their recording of Clori, Tirsi e Fileno. The cantata is performed rarely and has been recorded only twice before, but it is one of Handel’s most charming and accomplished Italian-period works. La Risonanza produces a delightful performance that presents all of the strengths and virtues we have come to associate with their recent explorations of Handel’s music. The orchestral playing is stylish, thoughtful and eloquent; the violin and lute obbligati are enchanting, and Bonizzoni’s well-paced direction from the harpsichord is exemplary. The three singers chosen for the parts of Clori, Tirsi and Fileno are superbly matched in taste and technical proficiency, but are also ideally different to enable clear and beguiling characterisation. La Risonanza and Bonizzoni are currently reaching towards the completion of their project to explore, perform and record all of Handel’s Italian cantate con stromenti – a fruitful collaboration with the Spanish early music label Glossa and several consultant musicologists. We hope that the critical and artistic success of their work encourages the artists and the label to continue exploring baroque vocal music. The panel of judges also congratulate this year’s close runners-up: a fine performance of the neglected opera Faramondo conducted by Diego Fasolis (Virgin), Zefiro’s superb recording of the Music for the Royal Fireworks (Deutsche Harmonia Mundi), and a compelling recital of duets and arias performed by Sandrine Piau, Sara Mingardo and Concerto Italiano (Naïve). La Risonanza’s Olinto pastore (Glossa) also received several nominations. The panel hopes that all of the artists and labels nominated for this year’s prize will be encouraged to continue producing fresh insights into Handelian repertoire. What is The Stanley Sadie Handel Prize? It is an annual award given to one distinctive new recording of Handel’s music, chosen by a specially invited panel of respected scholars and journalists who each possess a special and informed interest in Handel’s music. The winner is carefully selected from a comprehensive list of new recordings of Handel’s music released during the previous calendar year. The winner must satisfy tough criteria: it needs to combine fine interpretive quality with a penetrating or valuable insight into Handel’s genius. Thus this Prize is an indication of a recording’s quality and the significance of its contribution to Handelian knowledge. One of the prize’s founder panel members was the scholar, author and critic Stanley Sadie, and in 2005 the prize was renamed in his memory (its original title was the International Handel Recording Prize). We hope that this prize is warmly accepted as an appropriate legacy of Stanley’s unusual ease at mingling enjoyable journalism and superb scholarship together. In some respects it was influenced by the now defunct American Handel Society Recording Prize (1991–8), but in 2002 an international panel of judges inaugurated a broader forum to nurture recognition to a new recording of Handel’s music of noteworthy quality. This year’s winner was chosen by judges from Australia, France, Germany, Italy, Japan, Russia and Britain. La Lucrezia: Handel Italian Cantatas for alto and b.c.